The Antelope Valley Transit Authority was established April 1,1992 in response to area residents who expressed a strong desire for public transportation in the high desert. A Joint Powers Agreement between the cities of Lancaster, Palmdale and Los Angeles County was developed to govern the organization of the newly-formed AVTA. AVTA rolled its first bus down the streets of Lancaster and Palmdale on July 1, 1992. During AVTA’s first year in operation, the transit agency provided more than 900,000 rides. AVTA began by operating three services: Local Transit, Commuter and Dial-A-Ride. Access Services (formerly ASI) established to serve the disabled as a “complementary paratransit service” in accordance with the Americans with Disabilities Act (ADA). The Los Angeles County Board of Supervisors recognized AVTA for its efficiency. The California Transit Association recognized AVTA with an award for Transit Image. AVTA relocated to its new, larger facility with state-of-the-art equipment for maintaining its fleet, including a solar canopy covering a portion of the parking area, which continues to offset electricity costs for AVTA. The federally funded facility cost $21 million to construct and is located at 6th Street West just north of Avenue M in Lancaster. The Palmdale Transportation Center opened, providing citizens with a state-of-the-art transportation facility. The $14 million multi-modal hub offers connections between AVTA local and commuter bus service, Metrolink commuter rail service, Greyhound bus service, and Amtrak train service. AVTA won an AdWheel award from the American Public Transportation Association (APTA) for its innovative and appealing Local Transit Map design. AVTA won its first of seven consecutive AdWheel annual awards from the American Public Transportation Association (APTA). AVTA was recognized as Employer of the Year by Desert Haven Enterprises for its support and employment of the developmentally disabled for grounds keeping and janitorial services. An $11 million expansion project began in order to add new maintenance bays, more solar canopies, a new community room, and additional office space. A complete renovation of AVTA's main transfer center in Lancaster at the Lancaster City Park (now Sgt. Steve Owen Memorial Park) was completed. It is located on 10th Street West at Avenue K-8. AVTA enters a cleaner new era by adding 15 new diesel hybrid buses to its local transit fleet. AVTA again won an AdWheel annual award from the American Public Transportation Association (APTA). The California Transit Association honored AVTA with the Small Operators Transit Excellence Award. AVTA’s facilities expansion project was completed, adding new maintenance bays, more solar canopies, a new community room, and additional office space. AVTA embarked on their historic journey to become the first transit agency in the nation to operate a 100% all-electric zero emission fleet, with the first two 40' buses going into service. AVTA was awarded the William J. "Pete" Knight AIRE Award by the AVAQMD, and the Energy Efficiency Leader Award by Thermo King, both recognizing the agency's commitment to environmental responsibility. AVTA releases an RFP to purchase the first eight zero emission buses from local manufacturer BYD. AVTA introduced Track-It, a real-time bus location information system where customers can access real time information through AVTA's website and through the MyStop app. The fare structure is updated, with Day Passes now available for purchase on the bus. AVTA makes history by voting to purchase up to 85 new all-electric zero emission buses from BYD, officially becoming the first transit agency in the nation to commit to a 100% electric fleet. AVTA recognized by the White House for its leadership in the adoption of zero emission vehicles. The Southern California Association of Governments (SCAG) tapped AVTA to receive the prestigious Sustainability Award for Excellence in Green Region Initiative. AVTA launches Campus Connect, a free bus pass program for Antelope Valley College students. 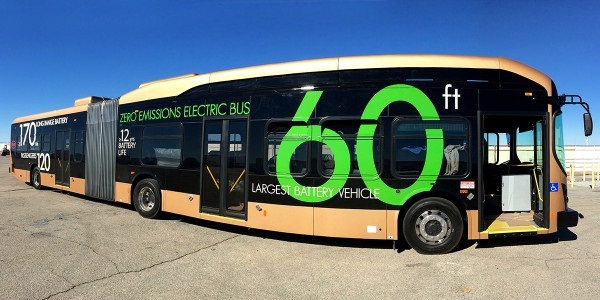 AVTA again made history by becoming the first transit agency in the world to operate an all-electric, zero emission 60' articulated bus in revenue service. AVTA reached another major milestone with the completion of the first ever WAVE inductive charging system in Southern California. The Coalition for Clean Air named AVTA the recipient of the Leadership in Government Award in June recognizing AVTA's plan to convert its entire fleet to zero-emission all-electric buses. AVTA is working to establish new commuter routes serving Edwards Air Force Base, Mojave Air & Space Port, and employers in Santa Clarita.